I visited my kidney specialist this morning, the first time since June. He was very happy with my bloodwork results from the hospital, calling them a vast improvement since the last time he saw me. Back then my kidneys were functioning at around 30 per cent. Today, he was pleased to tell me they're up to 66 per cent. Wow, that's some reversal! On the food front, I've actually graduated to sandwiches and I have an appetite - compared to a week or so ago when I really had to force myself to eat. 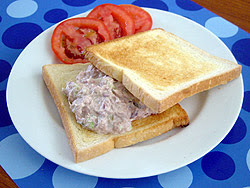 My favourite is a tuna salad sandwich. Things appear on the up and up! Next step: appointment at the Bone Marrow Transplant clinic on Friday.